A compelling account of the establishment of Tanzania’s stable and ambitious government in the face of external threats and internal turmoil. In the early 1960s, nationalist politicians established in Tanzania a stable government in the face of external threats and internal turmoil. 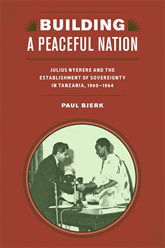 Paul Bjerk’s volume chronicles this history and examines the politics and policies of the nation’s first president, Julius Nyerere. One of the great leaders of modern Africa, Nyerere unified the diverse people who became citizens of the new nation and negotiated the tumultuous politics of the Cold War. In an era when many postcolonial countries succumbed to corrupt dictatorship or civil war, Nyerere sought principled government. Making difficult choices between democratic and autocratic rule, Nyerere creatively managed the destabilizing forces of decolonization. With extensive archival research and interviews with scores of participants in this history, Bjerk reorients our understanding of the formative years of Tanzanian independence. This study provides a new paradigm for understanding the history of the postcolonial nations that became independent in a global postwar order defined by sovereignty.